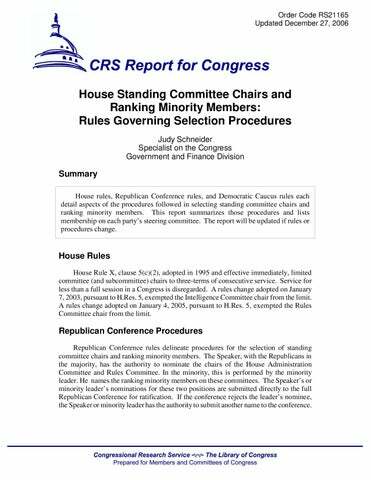 Summary House rules, Republican Conference rules, and Democratic Caucus rules each detail aspects of the procedures followed in selecting standing committee chairs and ranking minority members. This report summarizes those procedures and lists membership on each party’s steering committee. The report will be updated if rules or procedures change. House Rules House Rule X, clause 5(c)(2), adopted in 1995 and effective immediately, limited committee (and subcommittee) chairs to three-terms of consecutive service. Service for less than a full session in a Congress is disregarded. 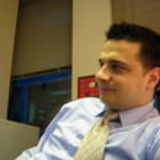 A rules change adopted on January 7, 2003, pursuant to H.Res. 5, exempted the Intelligence Committee chair from the limit. A rules change adopted on January 4, 2005, pursuant to H.Res. 5, exempted the Rules Committee chair from the limit. Republican Conference Procedures Republican Conference rules delineate procedures for the selection of standing committee chairs and ranking minority members. The Speaker, with the Republicans in the majority, has the authority to nominate the chairs of the House Administration Committee and Rules Committee. In the minority, this is performed by the minority leader. He names the ranking minority members on these committees. The Speaker’s or minority leader’s nominations for these two positions are submitted directly to the full Republican Conference for ratification. If the conference rejects the leader’s nominee, the Speaker or minority leader has the authority to submit another name to the conference. CRS-2 All other standing committee chairs or ranking minority members are nominated by the Republican Steering Committee and ratified by the full Republican Conference. Pursuant to conference rules, the Member nominated to be chair or ranking minority member does not need to be the Member with the longest continuous service on the committee. In the 110th Congress, the Steering Committee “interviewed” prospective candidates for ranking slots. Some of the new ranking members were the most senior members of the committee, others were not. The Steering Committee is composed of party leaders, selected committee leaders, class leaders, and regional representatives. The Steering Committee is reconstituted each Congress. Regions are restructured to reflect as closely as possible an equal number of Republican Members from each region. Each region elects its Steering Committee member. If Steering Committee members are elected from states that have four or more Republican members, a “small state” group is triggered to also elect a member to the Steering Committee; the small state group is composed of states that have three or fewer Republican members. Table 1 depicts the current membership of the Republican Steering Committee. Democratic Caucus Procedures Democratic Caucus rules address selecting committee chairs and ranking minority members. The Democratic leader nominates a chair/ranking member for the Committees on Rules and House Administration, who must be approved by the entire Democratic Caucus. The Budget Committee chair/ranking member is selected from among members choosing to run for the position. Other chair/ranking member nominations are made by the Democratic Steering and Policy Committee and voted on by the entire Democratic Caucus. In making selections, the Steering Committee considers, pursuant to caucus rules, â&#x20AC;&#x153;merit, length of service on the committee and degree of commitment to the Democratic agenda of the nominee, and the diversity of the Caucus.â&#x20AC;? The Steering Committee is reconstituted each Congress, and regions can be restructured to reflect equal Democratic representation among regions. The number of appointments made by the party leader can also change. Table 2 depicts the Democratic Steering and Policy Committee as constituted at the beginning of the 110th Congress.